An exploration of the impact of immigration on my relationship with my family and culture, this experimental video installation uses food as a medium for me to talk about three key phases I’ve been through with my family. The three video channels each cover a different stage in our lives and the stories that define that period. For maximum impact, view the video as projected onto a table and with headphones on! 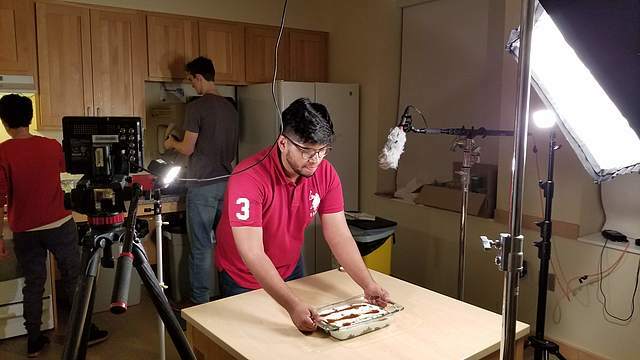 In 2018, while working on a project for a Experimental Film and Video Production class, I came up with the concept of “consuming” media, where the viewer gets the chance to get up close with the footage. To do this, I'd build a unique method of projecting downwards on a table instead of the traditional screen. While working on this much smaller project, I saw its potential to be a part of a larger installation that made use of footage shot specifically to be viewed in this format. I knew I wanted to work with food and I wanted to create something raw and personal. The combination of all these factors eventually led to the Comps topic I have today. Rirkrit Tiravanija’s Untitled inspired me to create an exhibition that has on the surface a simple premise: interact with food and culture. In this work, I’ve worked on blurring the space between screen and spectator by bringing the film right to them. While Tiravanija’s was a physical installation and worked directly with the food, I decided to complicate his exploration of food and culture by removing the physical presence of the food altogether. I started working on my Comps in the spring of '18, during the Experimental Film and Video Production course. I built a proof of concept for the kind of set-up I wanted for my project and installed it in the Weitz at the end of the term. After my proof of concept was approved, I wrote up a proposal enlisting a project description, project-specific supplemental materials (visual style, sound design, equipment, locations, schematic plans), timeline, methods, and budget. Over the summer, I took some basic equipment (tripod, Canon-60D, and some lenses) with me to San Francisco and shot some test footage and continued working on the theory that drove my Comps. Once I was back on campus in the fall of '18, I started to work on this installation more directly. I shot the footage over four cooking sessions and recorded the voiceover in three recording sessions. To form a poetic link between the image and sound, I wrote a sound-image script that helped me shape the mood and tone of the piece more intentionally. I got to screen multiple drafts of my work to my class and advisors, so the production process was pretty iterative. Once everything was shot and recorded, I began editing the channels. The editing process wasn't too complicated and consisted mostly of color correction and cutting up the various shoots together. Throughout the term, I got to collaborate with my fellow CAMS composers on their projects and mine. Considering my crew got food after each shoot, I'd say I gave everyone a pretty fair deal! During Winter Term '19 (right now), I've been working on getting the materials for my installation together. The piece will be up in the Weitz Space WCC229 starting Monday, January 21st to Sunday, February 3rd between 8am-8pm! Comps was an opportunity for me to challenge myself in a way I didn't think was achievable in a span of three months. Since this is the piece that caps off my CAMS degree, I believed that it should be one that I could pour my soul into and take risks wherever I saw fit. Given the flexibility of what we can work on and the seemingly infinite resources available to us, I tried to utilize as many opportunities as I could during the production of this work. Considering my longest film before this one was five minutes, building a ten-minute loop for three video channels has been quite a step up. I don't think I would've taken such a leap had it not been for the platform of Comps. For the time being, no. I'm pretty happy with the way this piece turned out and am excited to keep trying new ways to allow people to interact with cinema, but as far as this piece is concerned, I'm ready to close it where it is and hopefully come back to it in the future and add more channels! Come to my Comps talk on Saturday, January 26 from 11:40am - 12:10pm in the Weitz Cinema, and view the installation anytime starting Monday, January 21st to Sunday, February 3rd between 8 am–8 pm.